Eliminate the headache and hassle tracking down the correct parts when building your high performance 2.3 ford head with these engineered top-end kits. These kits are 100% drop in and require no machine work- assuming your head is already machined for oversized valves. 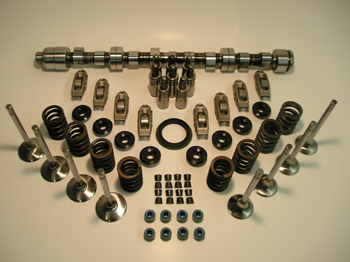 Available with or without roller followers (select below), these kits include a new BOPORT roller camshaft (stage 1-4), matched springs and retainers, oversized stainless steel valves, valve locks, performance wide groove HLA's, shims, and seals for the valves and cam. Stage 4 cam option no longer available.